Keshav Patel is finishing an honors thesis in mathematics. Lauren Gullet spends many afternoons collecting and analyzing data in Carolina’s Institute of Trauma Recovery. Daniela Alfaro plans to learn more about the factors, both biological and social, that caused her mother’s diabetes. 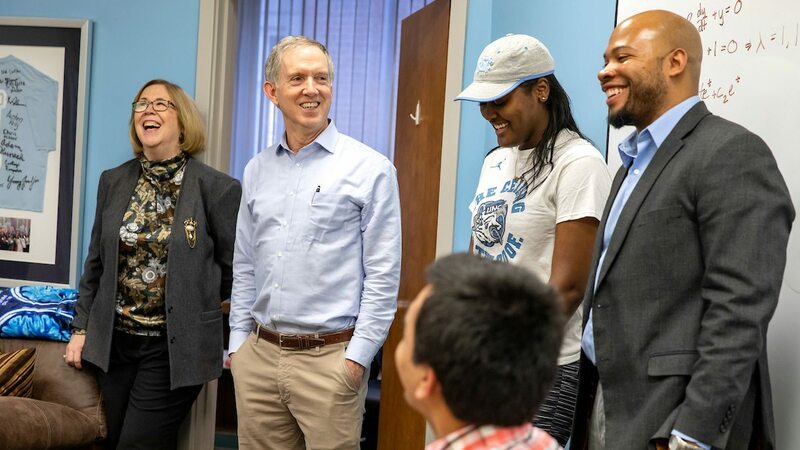 Two generous contributions to the Chancellor’s Science Scholars Program at the University of North Carolina at Chapel Hill will enable more students like these to pursue degrees in STEM. Designed to prepare students to pursue graduate degrees in STEM disciplines, the Chancellor’s Science Scholars Program offers merit-based scholarships, opportunities to participate in cutting-edge research, professional development, leadership training, mentorship and other programming. Students become members of a community of scholars committed not only to individual excellence, but to challenging preconceptions of the scientist archetype and creating a more inclusive culture within the STEM academy. Forty-five scholars have graduated from the program, Freeman said. More than half of that group has gone on to pursue an advanced degree in a STEM program.